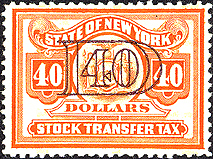 Not all stamps were used for postage. 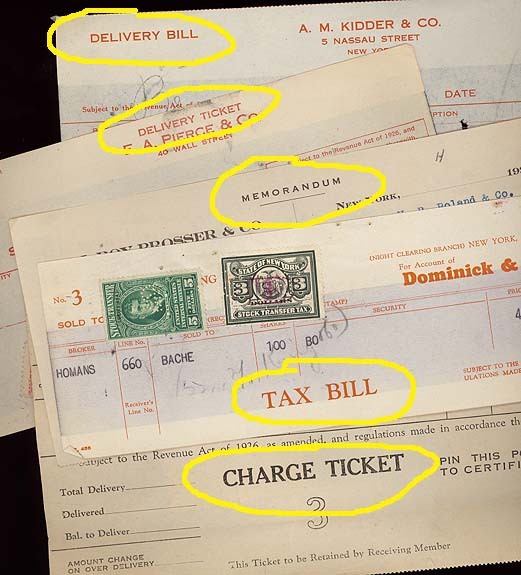 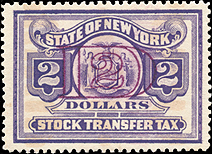 These tax stamps (or revenue stamps or fiscal stamps) were used to pay tax imposed by New York due to the Stock Transfer Stamp Tax of 1905 which taxed the sales of corporate stocks and certificates. 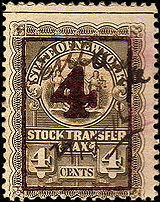 This threatened the movement of the Wall Street financial center over to New Jersey, but that never materialized (see image below). 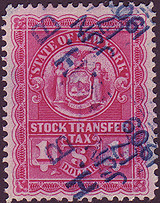 This tax lasted until 1981 although the use of the actual stamps ended much earlier. 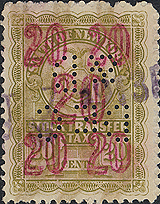 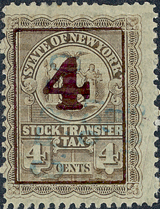 These stamps are considered "State Revenues" so you won't find them listed in a standard Scott Catalog. 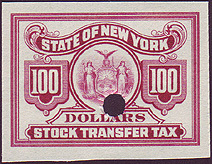 These were issued by New York State, not by the federal government. 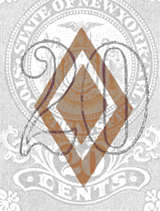 This is an ongoing project so there will be constant changes to this page as it evolves. 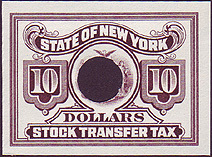 I would like to publicly thank Ken Pruess whose help was invaluable in the making and refining of this page. 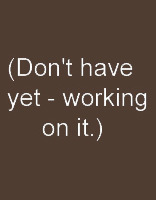 Make sure to check back again later - Thanks for stopping by! 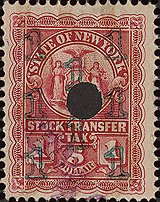 Over the course of about 40+ years, these revenue tax stamps have changed form many times. 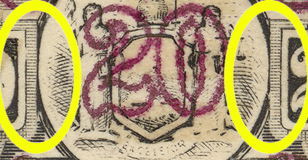 Sometime the changes were very obvious to anyone, but other times they were minor enough to need a magnifying glass to see the slight variation. 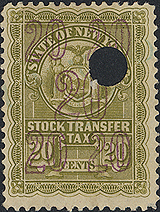 I hope this page is interesting for you and maybe even helps you narrow down or identify several of these state revenue stamps in your own collection. 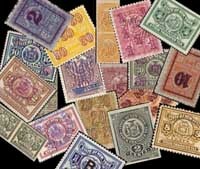 - Many of them are quite common, but a few are much harder to come by. 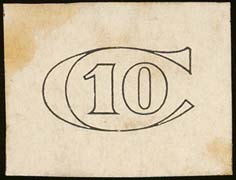 the ¢ symbol. 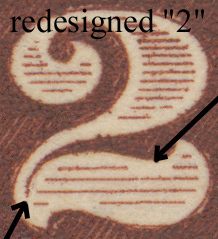 I have no idea why that is. 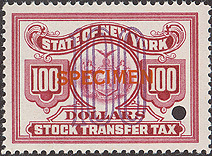 The stamps shown on this page are in no way the only color varieties available. 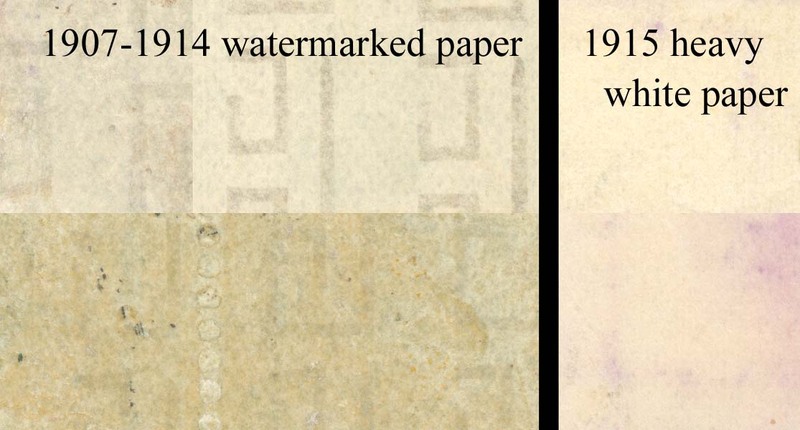 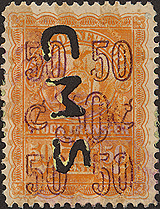 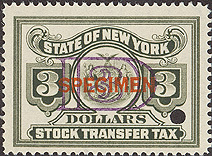 While some issues (usually the later ones / post-1930) have primarily one color type, there are multiple color variations for many of the early issues. 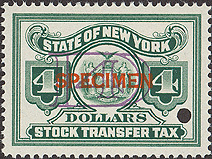 Overprint colors can vary as well. 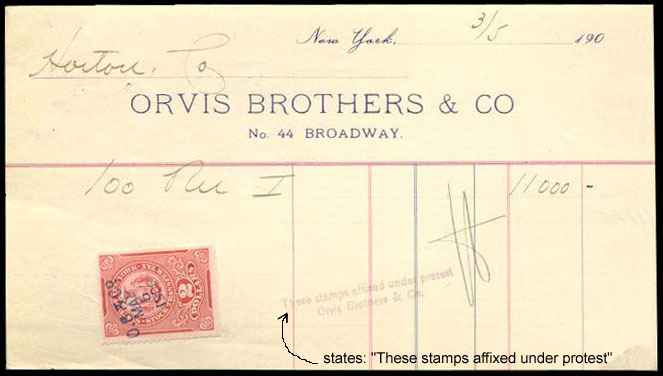 While most of the time these revenue stamps are found loose, sometimes it can be more interesting (and certainly more challenging) to collect them still attached to these Memorandums as they were originally used. 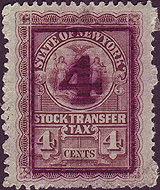 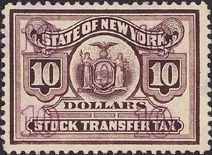 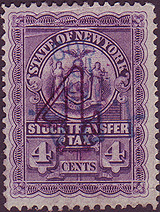 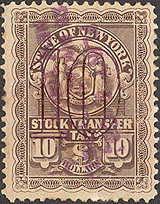 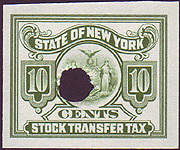 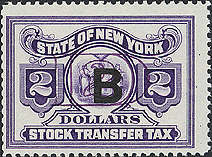 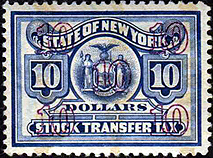 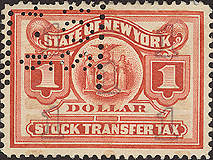 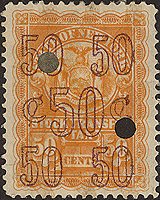 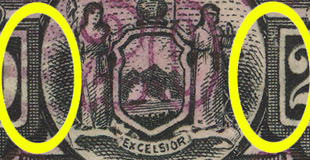 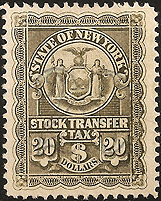 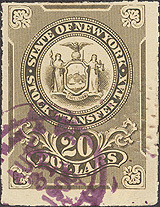 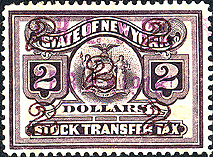 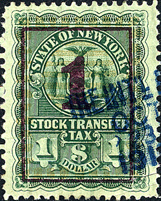 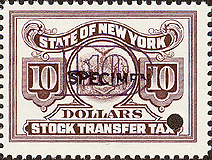 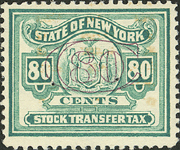 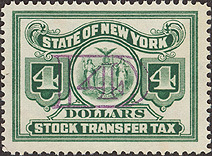 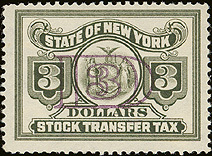 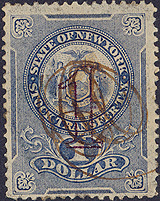 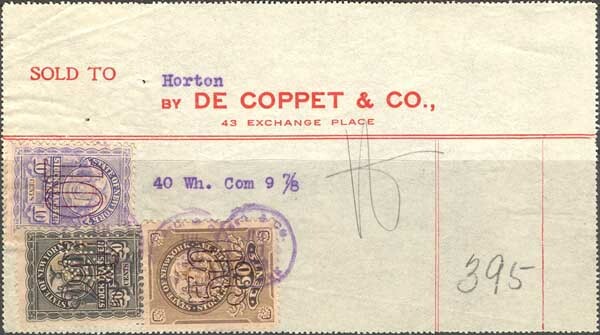 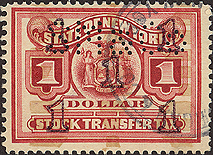 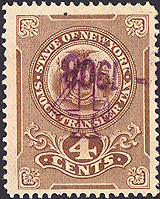 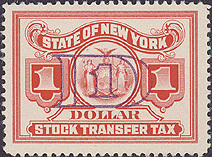 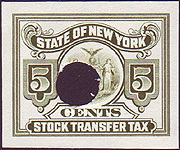 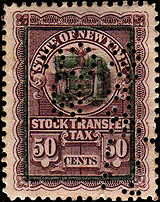 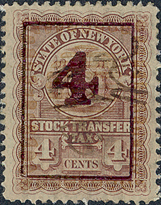 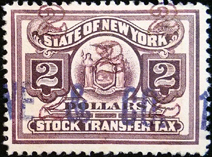 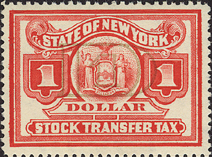 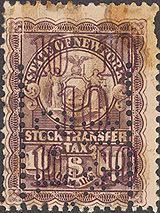 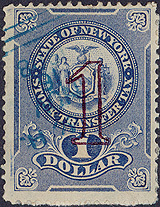 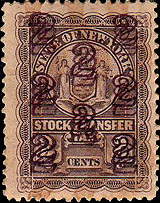 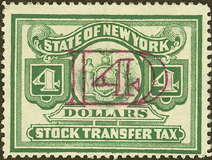 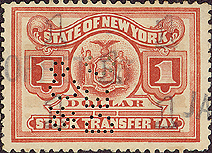 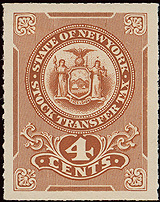 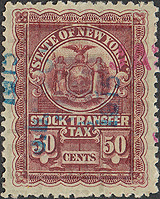 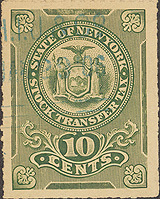 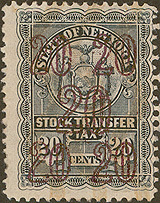 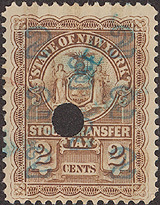 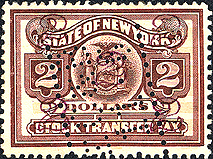 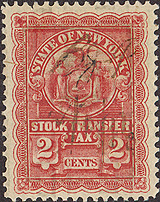 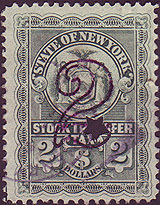 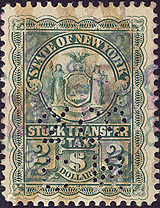 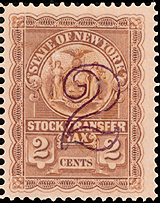 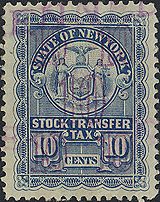 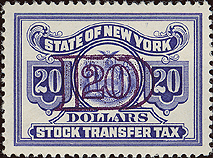 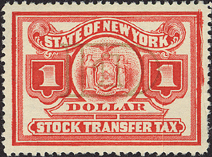 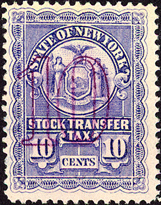 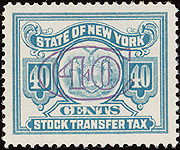 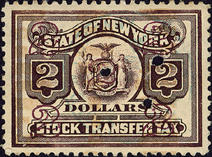 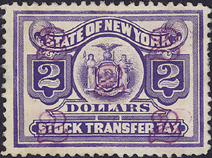 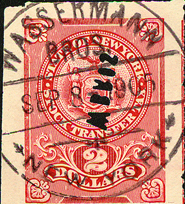 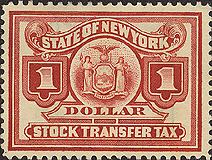 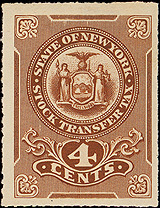 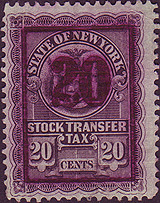 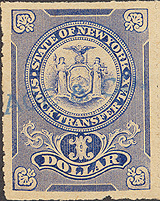 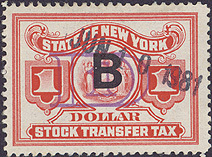 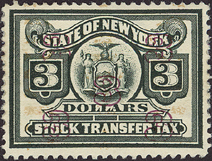 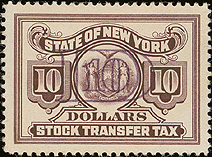 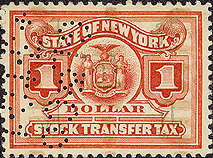 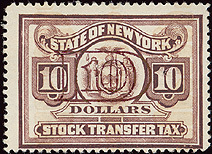 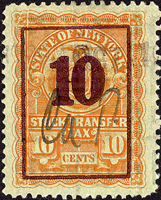 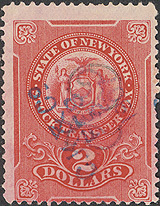 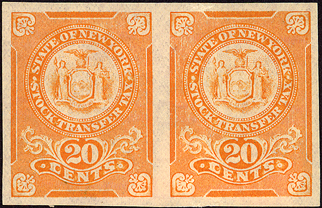 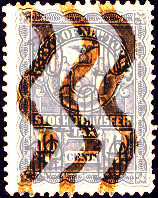 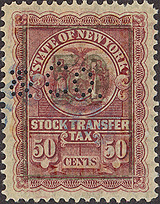 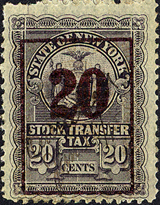 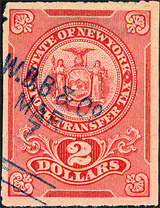 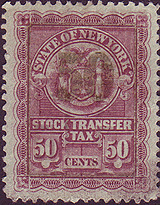 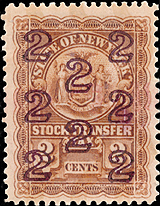 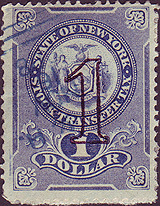 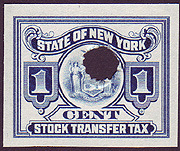 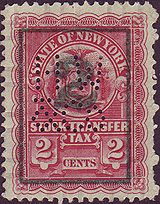 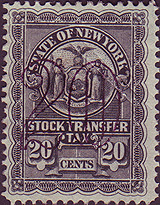 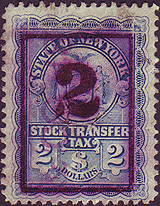 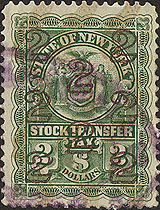 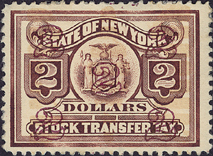 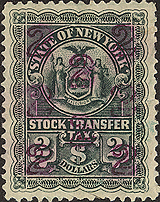 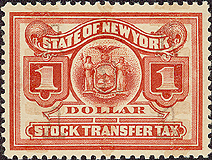 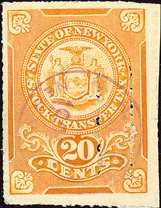 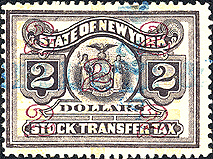 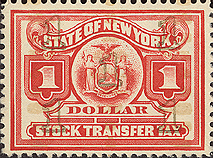 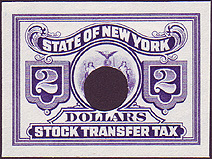 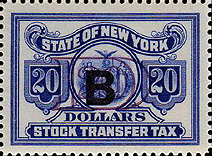 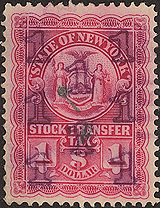 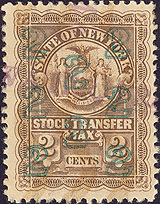 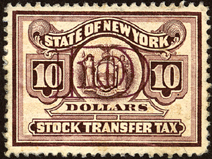 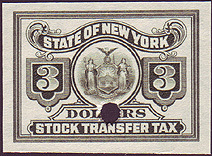 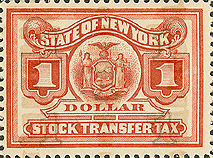 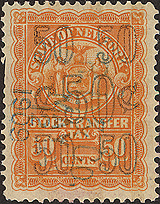 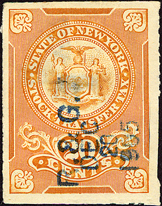 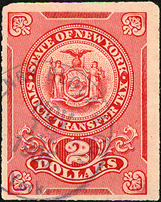 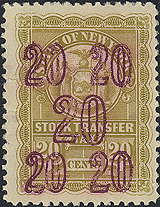 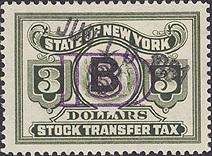 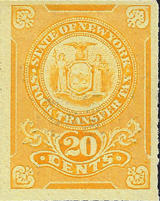 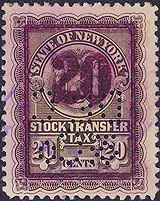 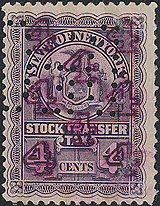 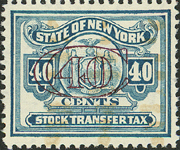 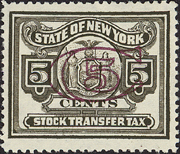 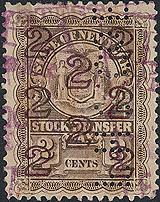 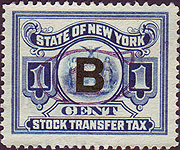 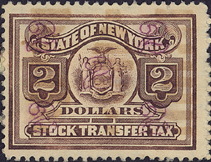 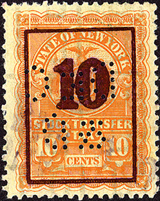 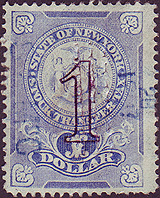 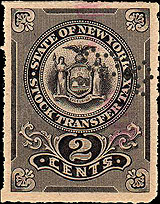 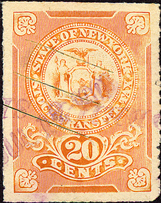 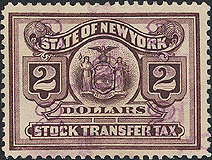 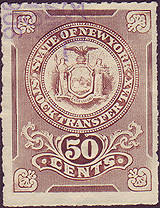 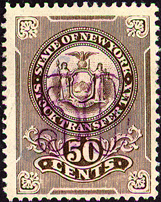 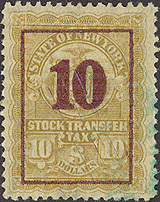 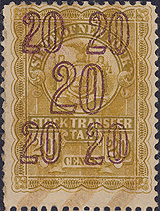 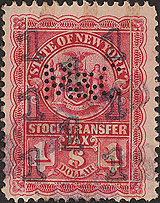 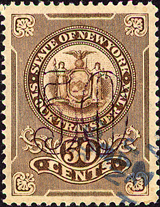 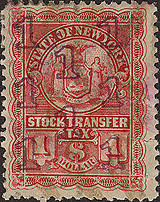 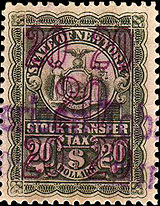 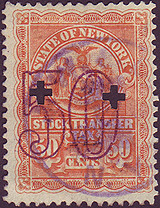 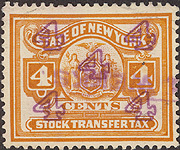 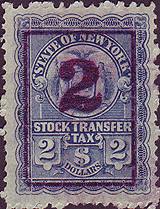 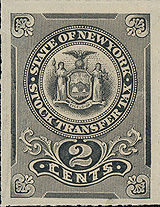 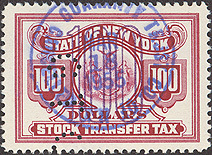 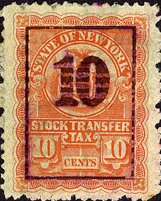 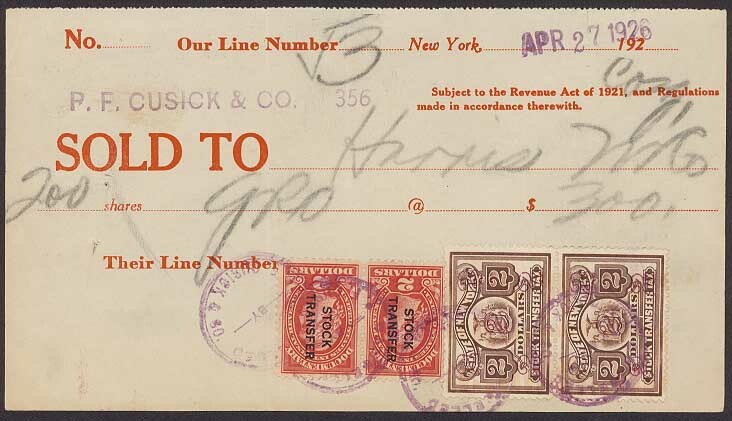 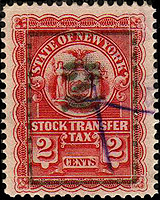 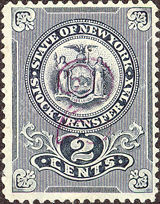 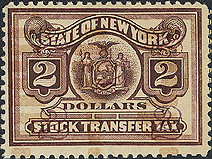 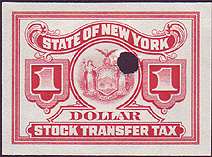 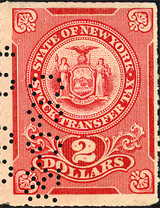 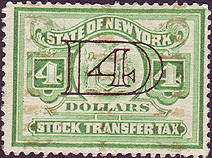 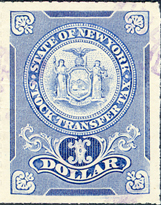 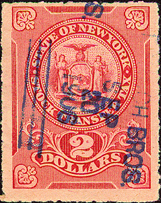 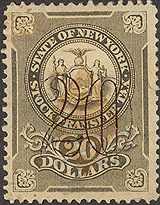 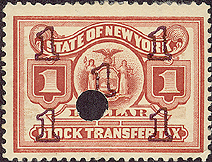 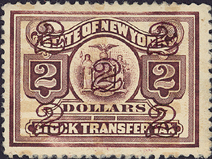 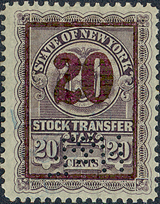 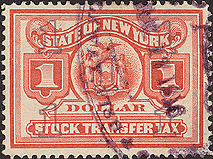 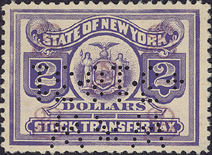 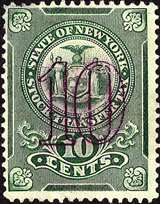 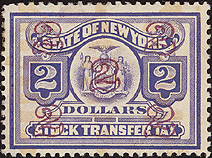 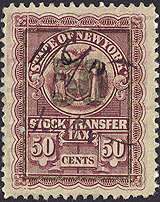 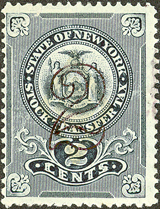 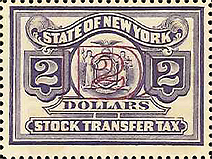 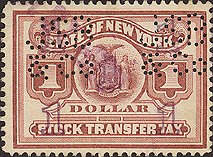 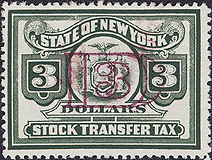 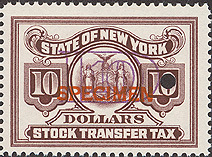 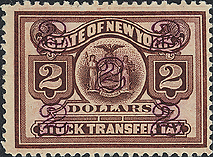 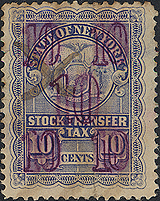 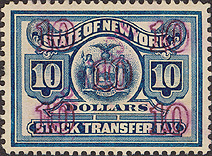 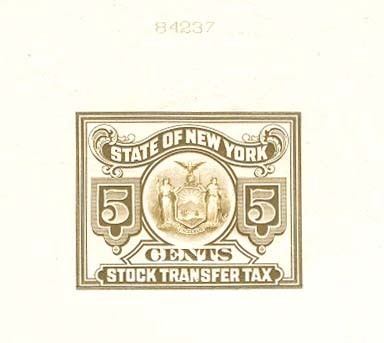 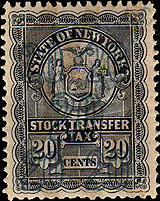 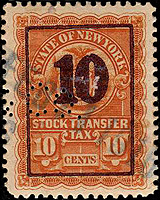 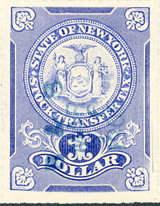 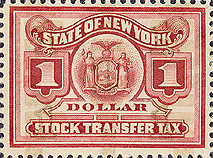 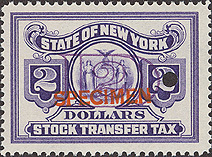 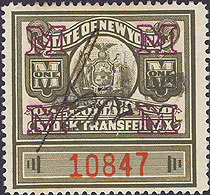 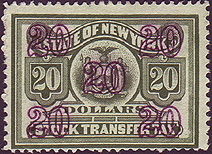 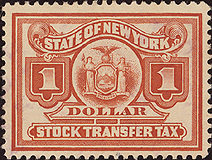 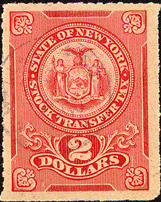 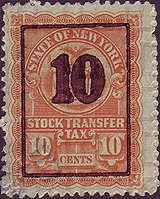 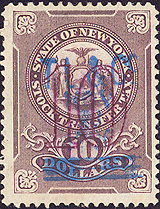 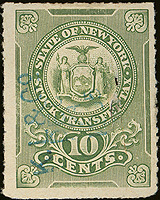 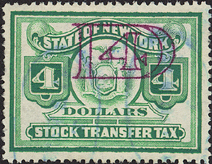 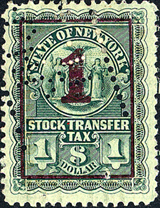 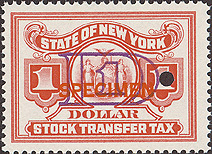 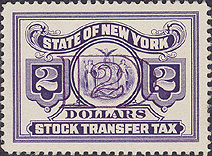 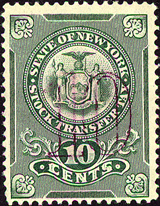 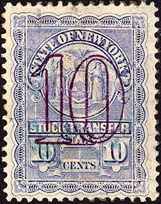 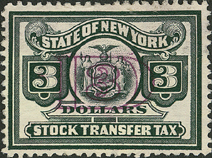 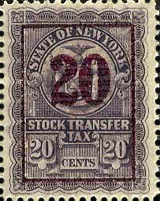 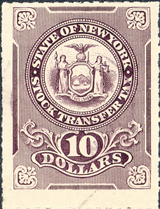 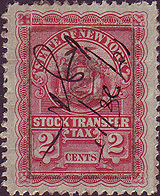 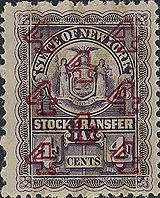 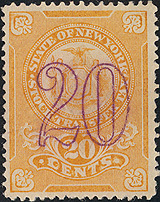 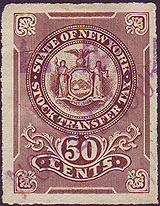 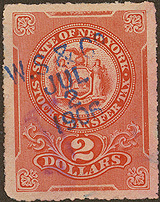 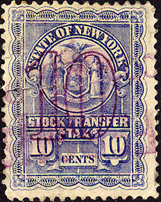 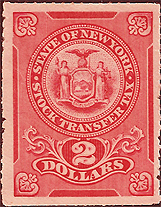 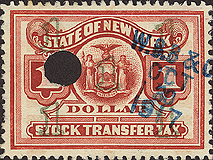 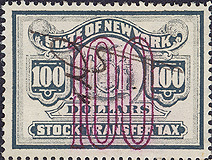 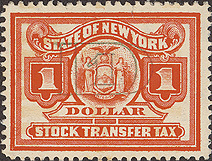 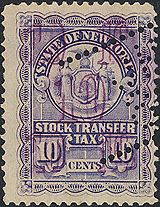 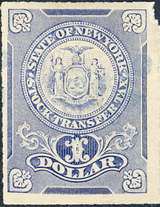 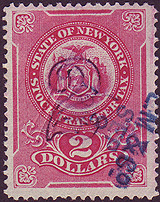 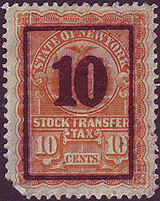 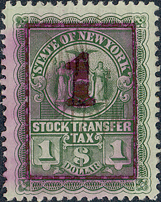 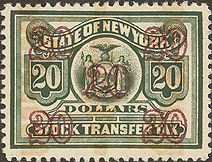 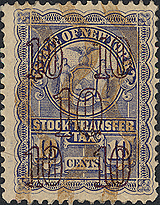 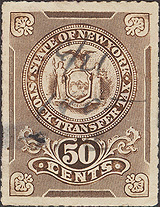 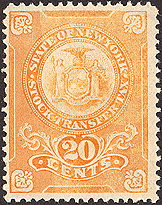 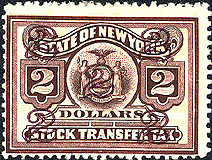 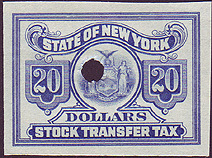 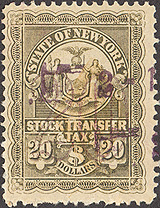 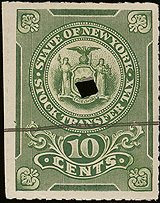 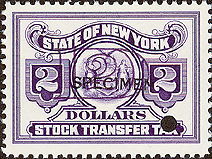 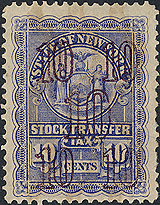 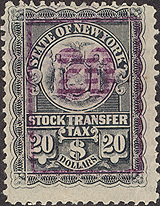 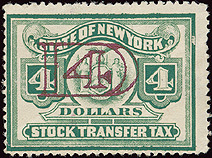 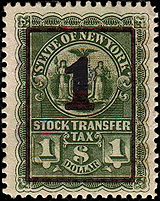 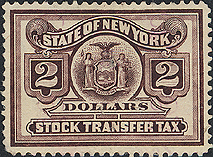 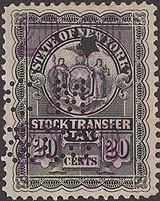 New watermarked paper was used beginning in 1916 with the repeating phrase "State of New York Stock Transfer Tax Stamp" which can be either forwards, reverse, or inverted. 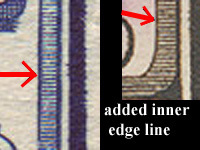 The watermark begins at a different spot on each line, but the entire pattern repeats every five lines. 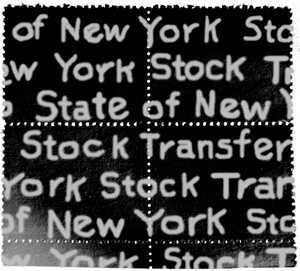 The entire length of the full phrase is about 19.5 cm (or 7.7 inches) in a font which is about 6mm (or .25 inch) tall. 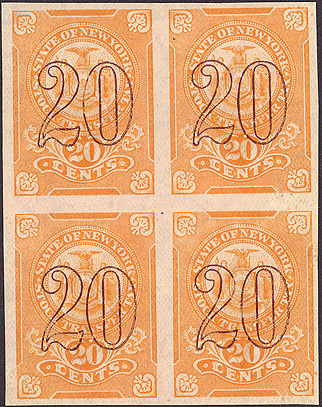 1922 - same as above series but the ends of the rectangle panels below "CENTS" have heavy, thicker ends. 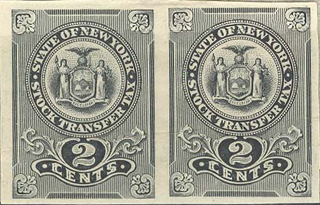 From this 1922 series on (until the completely re-designed 1943 series), these re-engraved versions of the "1" digit and the "2" digit were used on the 1 and 2 Dollar denominations. 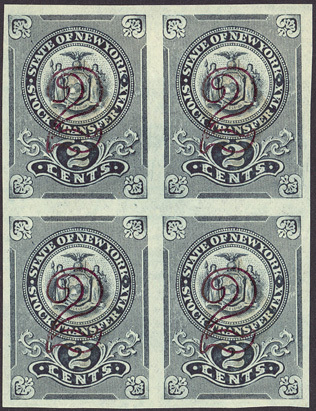 The two outer ones are overprint proofs. 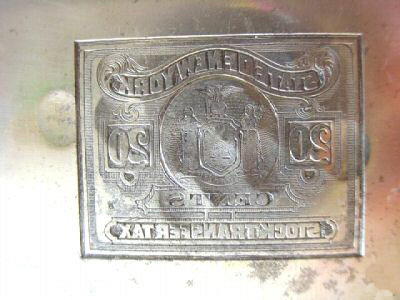 These are what the printing plates looked like. 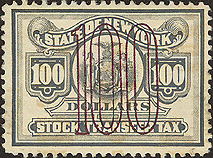 These have been purposely defaced to prevent them from being used further (causing the dimples from the hammer strikes on the printing side). 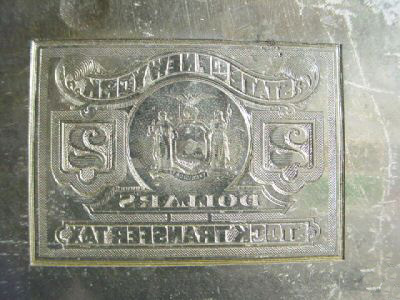 This is a Plate Proof for a 1943 version "ST158" - Thanks to Roger Libot for providing this image. 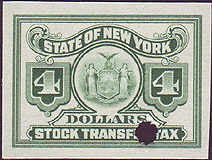 From 1932 on, the overprint design changed from the earlier checkered pattern of 5 or 8 digits to a single numeral of value inside a large "C" (cents) or "D" (dollars) - except for the "100" Dollar denomination. 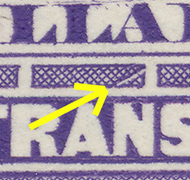 THEY ARE HERE!!! 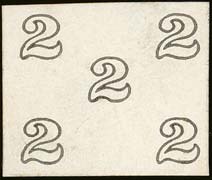 - I am now offering album pages for sale for this series - Read all about them here. 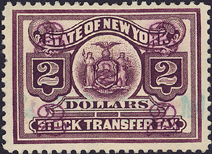 This link will show you a page of attached multiples including blocks and full sheets of New York Stock Transfer Stamps - THANK YOU to all who have contributed their images to share with others. 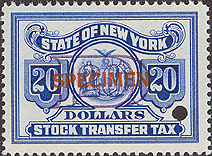 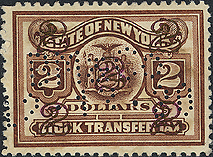 And a special treat for those of you who are diligent enough to have reached the bottom of the page - If you click here you can see what a full collection of more than 260 different New York Stock Transfer Tax stamps looks like. 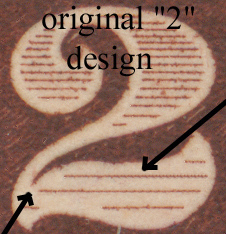 The image is a bit fuzzy to keep the file size reasonable because there's a screen-full and then some!